If you’re coming back for my third installment on woodworking tools, it can only mean one of two things: Either you are genuinely interested in eventually assembling a useful workshop and learning a new hobby, or you just want to learn more about tools so some of those conversations you have with your future father-in-law won’t be so one sided. Either way, I applaud you for wanting to increase the contents of your mind palace. The tools we’ll discuss today definitely fall into the “hobbyist” or “handyman” category. If you’re only going to try woodworking once, or don’t plan on doing more than two or 3 small projects a year, then you probably won’t want to go out and buy these. For one, they aren’t all that cheap unless you find them used (even then they’ll probably be $50-$100 for good ones). And two, everything except for the powered hand plane takes up a decent amount of space. I will mention this again, several times, because I know firsthand how disappointing it can be to buy a tool only to have it take up space in your already overcrowded garage. The bandsaw, as the name suggests, uses a long band with serrated teeth for the blade. It is powered by an electric motor that turns the guide wheels, which in turn move the blade. Think of the wheels like the front and rear sprockets on a bicycle, and the blade like the chain. I know that sounds like a chainsaw, but it’s different I swear. On a bandsaw, only a small portion of the cutting surface is exposed, and it would be damn near impossible to use a bandsaw to cut down trees. That’s a joke. Please don’t even try to do that. The bandsaw is used for making intricate cuts in wood, much like you would with a jigsaw. 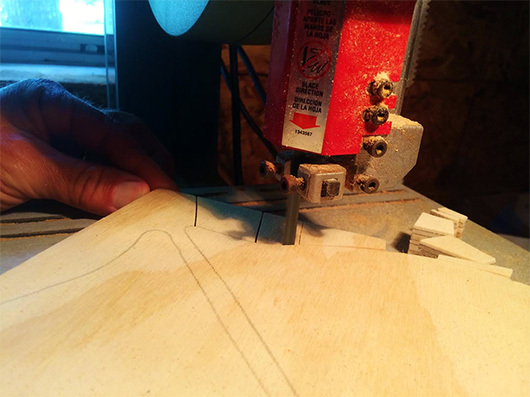 One advantage over a jigsaw is that the bandsaw can cut curves in thick pieces of wood. Also, with a bandsaw, the wood sits on a table and you can easily see exactly where the blade is and what it is doing. Bandsaws can also be used for cutting metal, and some models are used for cutting meat. A scroll saw is like the laser cutter of woodworking (yes they actually use lasers now, but that’s beside the point). It is used for making precision designs and complex radius cuts. Unlike other saws, the scroll saw is not named for the type of blade it uses or the way the blade moves. It is called a scroll saw because it is used to cut scroll work (cool curly designs) in wood. The best visual I can give you for the way it functions is this: Hold your thumb and forefinger like you’re showing someone how tall a shot glass is. Now imagine a blade running between your thumb and forefinger. Then, pivot your hand up and down at your wrist. That’s it! That small motion is all it takes to cut incredibly complex designs. The blade moves up and down in that one location and the wood is moved around to make the cuts. They are surprisingly quiet, and sling a minimal amount of saw dust. The blade can also be detached so that it can be fed through a hole in the wood. This allows you to cut out a shape inside a piece of wood without having to cut in from the outside edge. You can also use a scroll saw to make a jigsaw puzzle. The blades are relatively cheap, and they are also easy to change out. If you’re putting together a woodworking shop, I would recommend purchasing a scroll saw before a bandsaw. 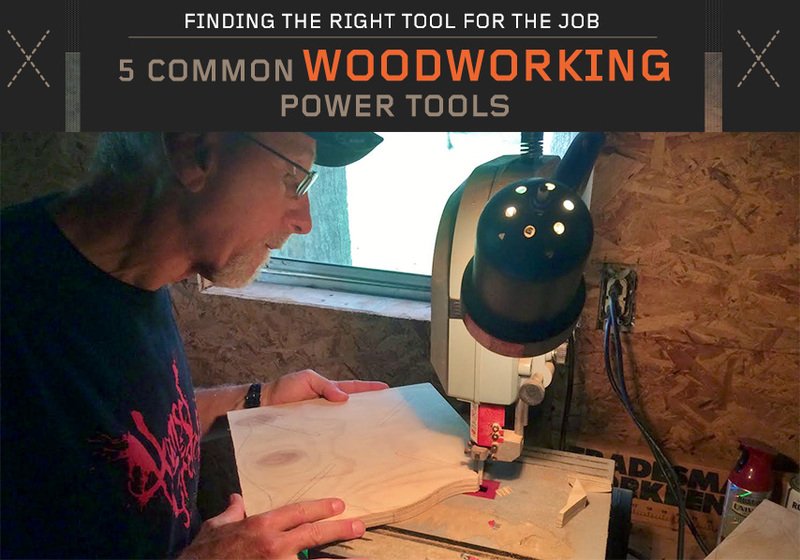 Both are good and useful tools, but you’ll develop your precision skills more quickly with a scroll saw starting out. If you’re interested, here is a cool Snapguide to making a simple but stylish wooden business card holder with a scroll saw. 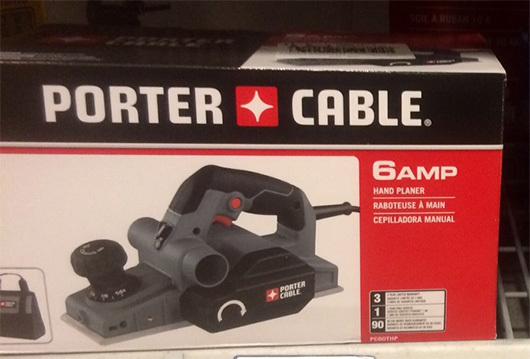 This combination sander is a great device. Set it on your workbench and enjoy how easy it makes rounding down edges and imperfections in your work. 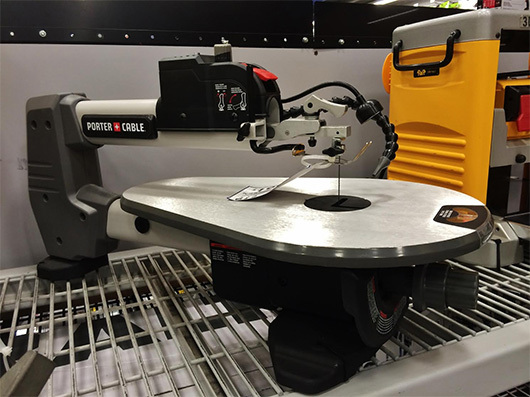 The disc portion is great for rounding corners on small pieces, and the belt portion is excellent for things like table legs, dowel rods, even metal pipe if you’re an amateur welder. You can do just about everything this tool will do with just a palm sander or folded up sandpaper, but this makes it worlds easier and much faster. However, unless you plan on having a dedicated woodworking shop, you’ll be hard pressed to get your money’s worth. Hand planes are tools that separate real woodworkers from people who just know how to build stuff out of wood. They are called planes because they allow you to change/correct/perfect the surface (or plane) of the wood. This is a tool where you definitely get what you pay for. My cheap ones are just frustrating. However, with a powered plane, some of the skill and technique is taken care of for you. The powered plane uses a pair of spinning blades (like a rotating drum) to shave down wood. This tool can be used for shaving down the edges of doors to help them fit. It can also be used to shave down imperfections in cheap boards, or to level out the warped portions. Much like the router, powered hand planes are noisy and make a heck of a mess. Eye protection is a must when using one of these. 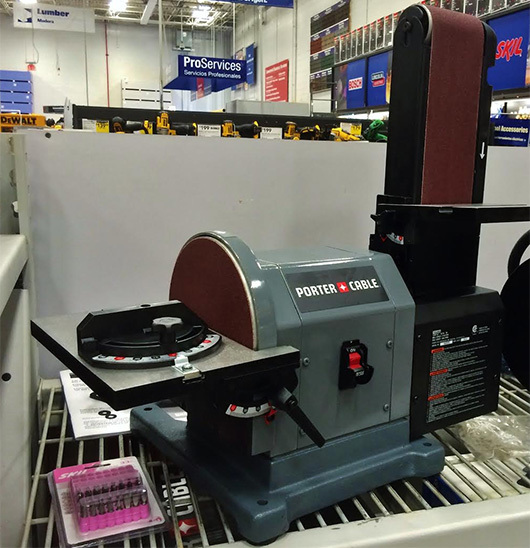 And, much like the disc and belt sander combo, you’ll need to use it a lot to see a payoff. If you don’t mind going the cheaper and more manual route, shaving down door sides and slight imperfections in boards can easily be done with a palm sander or inexpensive handheld belt sander. 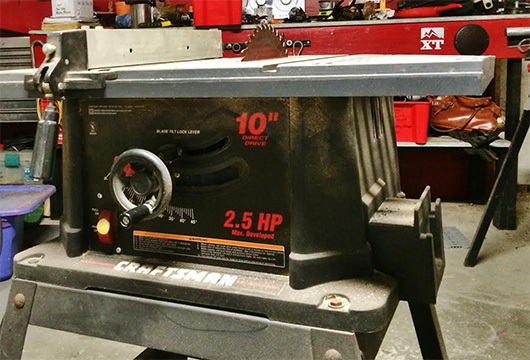 The table saw is exactly what it sounds like. It is a table with a round saw blade sticking out of it. They are used for making long straight cuts in plywood, or for cutting wide boards into more narrow boards. I use mine with just about every project I do. Some come with a roller on a stand to help support the boards as you slide them across the table, but I find having an assistant support the other end to be much more helpful. The height of the blade is adjustable, as is the angle at which it cuts. This allows you to cut angle edges when ripping down a board. The width of the cut is kept even by a piece of metal that latches on to the table, called a gate. This is a must have for any handyman, so long as you have the space for it. In a pinch, you can get by with a hand held circular saw, but the longer the cut, the more difficult it will be to keep straight. Hopefully this series will help you make some informed decisions when you are contemplating buying a new tool. Something you probably noticed was that the names of these tools pretty much describe either how they work, or what they do. This little sprig of knowledge should help take some of the intimidation out of these tools. Next time a discussion involving tools comes up, don’t feel inadequate if you don’t fully comprehend what they’re saying. Workout your mind muscles a bit and figure out what they’re talking about. If you have any questions or requests for info on other tools, post up in the comments! You know, although there appear to be planes on either side of it, the tool in the centre of the picture on the plane post looks an awful lot like a biscuit joiner. I only mention it so someone going to the store to get a planer doesn’t get confused because they’re looking for the wrong thing. Good eye and good point Dan. It is in fact a plane but I was skeptical when I saw it on the shelf. We all know how big box stores are about just tossing stuff in the wrong sections. To be honest, after looking it over, I kind of like it more than the traditional plane layout. The handle is really comfortable. I’ll see if I can get a model # next time I’m there. I just found out from my wife I need to go get some garden stuff tonight, so I’ll check it out. If I remember right, it was a Special Order Return, but I’m not having much luck finding it on DeWalt’s site. It could be a phase out, and if so, I’ll see what else they have. This was like a plane with all of the dangerous bits exposes. Ok, not exactly. It was like a joiner but with a wider, plane like blade, and mounts for guides on the sides. If it is phased out, I would recommend this one. Sorry Dan, no luck when I went back. The guy working knew which one I was talking about but didn’t know anything about it other than they don’t usually carry it. I got a new picture of a more traditional one, and Andrew was kind enough to update the article to avoid more confusion. Thanks for pointing that out, and good luck with your projects! Thanks! I liked this one. I just put down some wood floors and it was quite helpful. You describe an incredible comparison of band saw and a scroll saw. I have read your full post and learn a lot of things. You wrote so well that it is such a useful site and shared delightful information.